Wow, time sure flies by quickly as I can't believe 7 weeks have already passed and it's the start of another new Learn-To-Skate session. I'm excited to meet my new students and of course, have my old students back. This time around will be especially challenging because I have to teach three different classes at the same time! However, it will all work out because my advanced students can demonstrate skills to the younger kids which helps them better learn from their peers. My older students also get to show off and have more practice refining their skills. As we start our new session in a couple of days, I already anticipate questions from parents and students about whether they signed up for the right class and whether they should stay back or jump ahead. 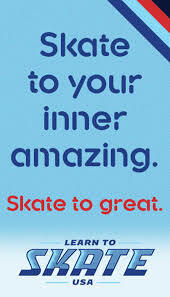 So let's review the Learn-To-Skate USA curriculum and the different programs and classes offered for all ages and skill levels.